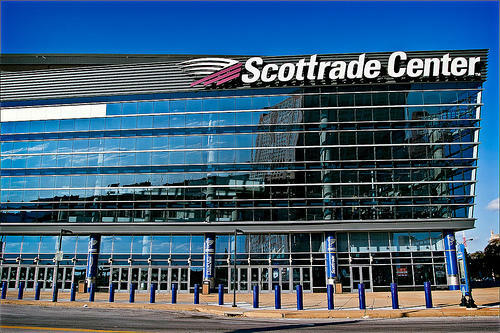 St. Louis hosts its own version of "March Madness"
The MVC men's basketball tournament and NCAA wrestling championships will be held at the Scottrade Center. The St. Louis region is kicking off what the St. Louis Sports Commission is calling its version of "March Madness." Beginning with the Missouri Valley Conference men's basketball tournament this weekend, the area will host four straight weeks of college sports tournaments. The region will also host the MVC women's basketball tournament from March 8-11 at The Family Arena, the NCAA Division 1 wrestling championships from March 15-17 and the NCAA Division 1 men's basketball regional on March 23 and 25. St. Louis Sports Commission president Frank Viverito says St. Louis has hosted more college regional tournaments over the past 20 years than any other city. He says being selected to host these events is getting harder. "The competitive landscape for bringing events like this to a community is changing a lot," Viverito said. "It's getting more and more difficult for these things to be won for this region and so I think everybody has to kind of understand that they need to be supported and they need to be protected." The tournaments are expected to draw 35,000 to 45,000 visitors while bringing tens of millions of dollars in economic activity to the region.